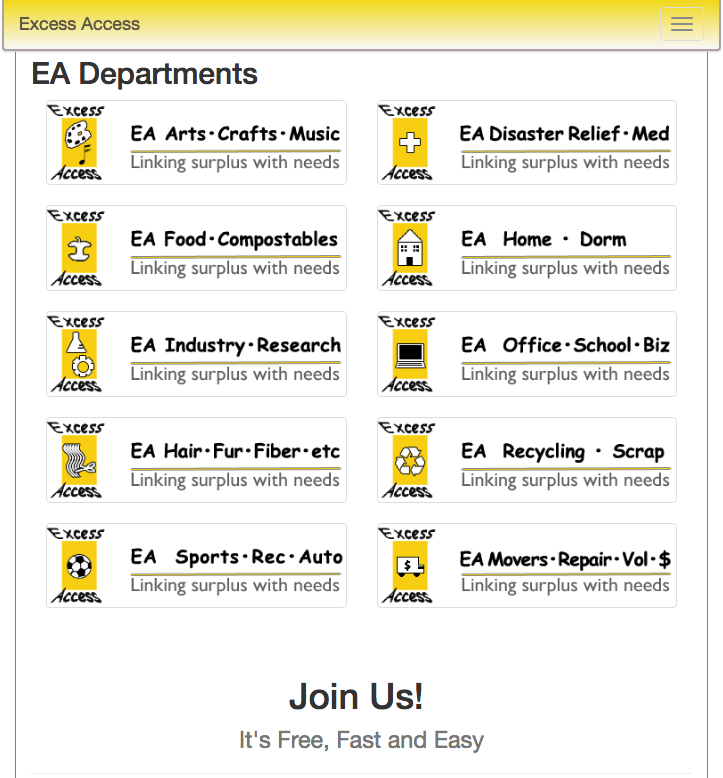 ExcessAccess.org is our free, online, mobile-friendly, database available to everyone. It automatically links business, nonprofit, and household item and material donations with the wish lists of nearby recipients who can pick up or accept drop-offs. It is now divided into 10 departments which allows for better sorting and faster matching. There are also opportunities to post green jobs like repairs and delivery as well as volunteer needs and funding. This program serves the USA, Canada and beyond. Every day, thousands of tons of garbage ends up in landfills. ExcessAccess.org makes it easier to put these materials to better use and extend the lives of second hand goods. We also offer intra Excess Access matching within large corporations and government entities (assisting procurement reduction and lowering carbon footprint through in-kind giving programs). In 1996, Lisa Gautier, Matter of Trust founder, had been given a new rug and wanted to donate her perfectly good old one. She went to a nearby school and gave it to their library for a story-time area. When dropping it off, she asked the principal if there was anything else the school needed and Lisa got her first “wish list.” She went to nearby businesses and asked friends if they had any of these items and was so surprised that she got five times as much as she asked for. Clearly, there was a missing link between donors and wishers. In 1998, Lisa and her husband, Patrice, set up the public charity Matter of Trust and its first program ExcessAccess.org. This was done with the help of Leo Nevas Esq. He was Paul Newman’s attorney and familiar with green businesses and public charities. Besides furniture and other goods, ExcessAccess.org quickly became the place for people donating waste fiber clippings for our Clean Wave program that accepts hair, fur and fleece donations to combat oil pollution. Together ExcessAccess.org and Clean Wave received a lot of press during the Cosco Busan San Francisco Bay oil spill (2007) and the BP Horizon Gulf of Mexico oil spill (2010) amongst others.